The conceit behind the Jonathan Creek series is that as creator of illusions and props for a well-known magician, Creek’s talent for deceiving audiences gives him insight into the illusions attempted by criminals in the commission of crimes. 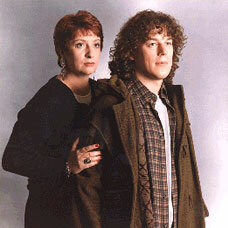 As a detective series, Jonathan Creek is fair to middling. The mysteries are only mildly intriguing and the solutions too often rely on gadgetry rather than logic. What makes this show truly watchable is the potato-faced, longhaired Alan Davies who makes Jonathan Creek one of the most engaging television sleuths since James Garner’s Jim Rockford. Like Rockford, Creek is an unflamboyant eccentric, a quiet man with very decided opinions and flaws that are reassuringly familiar. Much of the humor running through this show is based on Creek’s blunt unaffectedness set against the overdramatic worlds of stage life and tabloid television. One of the funniest moments in the two new episodes is a scene where a streaker disrupts a magic performance, cavorting wildly about the stage while Creek watches helplessly from the wings, his hands clasped over his head, his face a mask of dismay, perplexity, and resignation. Julia Sawalha is introduced as Carla, Creek’s new sidekick in this series, an ex-girlfriend now married to a television executive and the hostess of a slick, trashy British true-crime show. Sawalha is so physically attractive in this role as to be almost unrecognizable to American viewers used to seeing her as the dowdy Saffy in Absolutely Fabulous, but she maintains the same shrill air of permanent aggrievement. In fact, her performance is perhaps too broad for American audiences. Where Creek, who is supposed to be a nonconformist, is understated and believable, Sawalha, who is supposed to represent the media establishment, comes across as a shrill caricature, and her performance often grates rather than amuses. As for the stories, the first is a locked room mystery involving a serial killer and a murdered police officer. It opens with a nicely creepy "TV reenactment" of a murder and, as the episode that introduces Carla as a character, has some good digs at the business and politics of running a TV show. The second, more interesting episode, involves a Madonna-like pop singer and her husband, who is passionately in love with her public persona and disappointed with the flannel pajama wearing reality of his married life with her. Of course, there’s a puzzle for Creek to solve involving adultery, a video-tape, and a haircut, but the real amusement is in watching the dissatisfied husband, his down to earth show biz wife, and Jonathan Creek. This series apparently has a very loyal fan following, so it may be seen as sacrilegious to suggest that Jonathan Creek would be more satisfying if it dumped the whole detective premise and simply concentrated on Creek’s life in show business. The fact remains that Alan Davies’ performance is the most appealing aspect of the show. The mysteries just provide a rather clunking and unconvincing framework for it.